Powers/Abilities: The Reaper possessed superhuman strength and durability. It was able to shapeshift and was aided in battle by a number of wraith-like females. 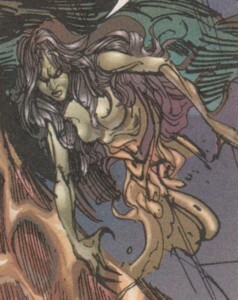 The creature's left arm was formed like a hook and it possessed instead of feet only fleshy tentacle-like extensions. Some of those extensions could connect the Reaper's girls to him. As weapon the demon used a giant Cat of Nine Tails. Although it needed the blood of several animals to summon the Reaper it is unknown if the demon had to consume blood to survive or stay strong. Not much else is known about Reaper's strengths or weaknesses, but the demon shared at least one weakness with vampires: sunlight. (Blade: Vampire Hunter II#2 (fb) - BTS) - At an unknown point in the past Reaper was first summoned (or created) by the Ancient (supposedly by Saracen). The demon served them for an unknown time. (Blade: Vampire Hunter II#3 (fb) - BTS) - After being gone for eons many vampires believed that the Reaper was just a legend. (Blade: Vampire Hunter II#2) - The Reaper was summoned in an ancient crypt deep below the Coliseum in Rome by the Ancient Saracen. Reaper bowed to his master Saracen and accepted his order to hunt down the prophesized Daywalker Blade. Silverfang Units attacked the crypt, but fled when there were outnumbered by Purebloods and the Ancient. On their escape Reaper and his girls first slew their scouts and then the rest of the Silverfang Units. (Blade: Vampire Hunter II#3) - Boy and Saracen talked about the Reaper while the demon was on his way to Silvereye's HQ Blackeye 1 (if I'm not wrong he used a jet to get there; see comments). (Blade: Vampire Hunter II#4) - Reaper came in from the stratosphere and flew to Blackeye 1. It attached itself to the hull and punched a whole in Blackeye 1's side. Then the demon and his girls entered the flying HQ and headed straight to Lab 1-5 on their search for Blade, but they only found Hrolf and Silverfang Units. (Blade: Vampire Hunter II#5) - All present Silverfang Units were slaughtered by the Reaper. His girls showed him Hrolf, who hid from Reaper and the Reaper smelled that he had the ancient smell on him and told his girls to let him go. His next order for the girls was to find the Daywalker for him. One of the girls was lured to Mikado's proximity bomb by Blade and died when it exploded. Reaper and the other two girls found her remains. When Venginian learned of the Reaper's attack he thought that Saracen was a fool to send the demon. On their search for Blade the fire confused Reaper and the girls and the girls assumed that the Daywalker was killed by the explosion, but Reaper still smelled him and sent his girls out to find the twins, because they had ties to his target. Reaper and his girls found Mikado and Mosha at Blackeye 1's landing bay when suddenly Patriot entered the room dressed as Blade. He attacked Reaper ferociously, but had no chance against him. Reaper and his girls were confused by the easy win and while Reaper went for the kill, his girls attacked the twins. Then the real Blade arrived and tossed a sunblast grenade at Reaper, who was freaked out by it. Blade and the twins went outside, but Reaper and his girls soon followed them. Patriot returned and attempted to attack the Reaper again, but instead of the Reaper he only got the girls and was then thrown from the flying HQ with one hit from Reaper. Patriot held on to one of the girls, cut her connection to Reaper and seemingly fell with her to his death. Reaper and his last girl continued their hunt for Blade. (Blade: Vampire Hunter II#6) - Blade went to Blackeye 1's control room to prevent Blackeye 1 from crashing into a populated area. Reaper's last girl found and attacked him soon afterwards, but Blade escaped her grip and nailed her to the wall. Reaper was not far behind his girl and started his final attack on Blade, who was still trying to prevent a crash into a populated area. He managed to head the HQ to the cemetery where he was found and then jumped Reaper right before Blackeye 1 crashed. Both survived the crash and continued after a short struggle inside the ship their fight in the cemetery. It was Reaper's power against Blade's swiftness with his sword, but soon Reaper's power proofed to be too much for Blade. After a hard punch the Reaper buried the vampire hunter beneath his lower body and was ready to kill him. In that moment the sun began to rise and Reaper screamed in agony. He tried to quench the fire with earth, but Blade grabbed the demon and pressed it over his head so that the sun could burn the Reaper to ashes. Reaper's last girl attacked Blade from behind and he had to drop the screaming Reaper. Rank saved Blade from the girl by cutting her head off. The Reaper was gone and his last girl was dead and burnt by the sun. (Marvel Knights Encyclopedia) - Reaper was destroyed by the exposure to the sunlight. Comments: Created by Bart Sears (writer/pencils) & Andy Smith (inks). 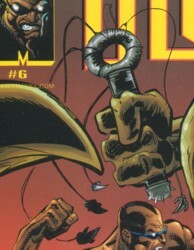 This series occurred after Blade was bitten by Morbius in Peter Parker: Spider-Man II#8. When the Reaper was on his way to Blackeye 1 a jet was seen after three panels with its face. I'm pretty sure that he wasn't flying that thing on his own. He possibly had a pilot and was dropped from the jet after reaching the stratosphere. At the end of Blade: Vampire Hunter II#6 I wasn't so sure about Reaper's death. Blade dropped him, Reaper took a nosedive into the ground and on the next panel the demon was gone. Only the revelation in the Marvel Knights Encyclopedia assured me of Reaper's death. Reaper used this weapon in battle. It was presumably given to the demon by Saracen. It mostly resembled a medieval Cat of Nine Tails. Like most weapons of that kind it had spikes at the tips of the strips. It is unknown what the strips were made of. They were three nearly identical female demons that clung to the Reaper's side. They were able to fly and could cut people into pieces with their razor-sharp talons. Instead of feet they possessed similar to the Reaper only strings of flesh which could connect them to the Reaper for unknown purposes. Annoyingly they often repeated the Reaper's last words. They all seemingly died during Reaper's hunt for Blade.